1. Press power button to switch wind modes. 2. 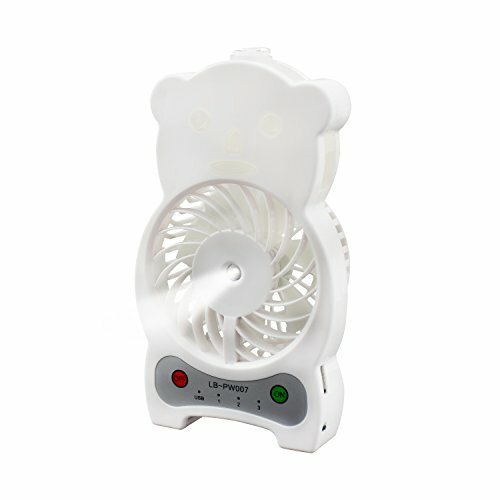 When the fan is working, hold down power button for seconds to switch light. 3. Press mist button to switch misting mode. 4. Open the cover of the water tank on the top to add water. 5. Connect the USB cord to recharge from USB port or USB adapter, you can also connect the USB plug with charging adapter so that you can charge with home power supply. 1. When the battery is going out, the light will flash to warn for recharging. 2. It has continuous misting mode and short misting mode, when it's in continuous mode, it will automatically stop spraying after 10 minutes working, and in short misting mode, it stops in 20 minutes. 3. When recharging the red LED will light up, and when it's full battery the green LED lights up. 4. Do not overflow when adding water to avoid short circuit of the battery. 5. Working under circumstance of 60°C will probably shorten the battery's life or damage it. 6. When charging, please use USB port or DC 5V recharging adapter. 7. To avoiding damage of product, don't put objects into the fan when it's working. If you have any questions about this product by Taotuo, contact us by completing and submitting the form below. If you are looking for a specif part number, please include it with your message.